A thoracic aortic aneurysm is an enlargement of the aorta in the thoracic cavity (chest area), which is the first part of the artery that takes blood away from the heart. A thoracic aortic aneurysm can progressively enlarge over time and doesn’t usually have symptoms. However, if an enlarged aneurysm is not surgically repaired, it can lead to an acute aortic dissection, a tear that causes the walls of the aorta to separate and allows blood to flow where it shouldn’t. This is potentially life-threatening. What other names do people use for familial thoracic aortic aneurysm and dissection? What are the characteristics of familial thoracic aortic aneurysm and dissection? What are the causes of familial thoracic aortic aneurysm and dissection? 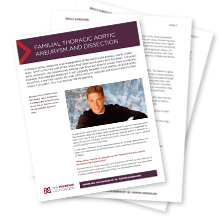 How is familial thoracic aortic aneurysm and dissection managed? Find these answers and more in the "Familial Aortic Aneurysm and Dissection" download.